According to a new rumor, the number of pre-orders for the Samsung Galaxy S6 and Samsung Galaxy S6 edge in the U.S. are more than double the number of phones reserved in the states last year for the Samsung Galaxy S5. After the Samsung Galaxy S5 was met with a lukewarm response in 2014, Samsung reportedly started Project Zero to rebuild the flagship model from scratch. Replacing the plastic build with a metal frame sandwiched by two pieces of Gorilla Glass, Samsung went for form over function. The removable battery cover is gone as is the microSD slot. But there are solutions to both. Samsung is offering the Galaxy S6 and Galaxy S6 edge with storage options of 32GBG, 64GB and 128GB which means that the phones are available with enough native storage to keep even app hoarders happy. And portable power banks are available to enhance the battery life of both models. Samsung obviously made the right decisions. The manufacturer is looking for ways to keep supply matched up best it can with demand for the handsets. One rumor has Samsung eager to triple the production of the Galaxy S6 edge so that supply doesn't fall hopelessly behind demand. In other words, the Samsung Galaxy S6 and Samsung Galaxy S6 edge are both red hot. Unfortunately, we don't have precise numbers to share, but the gist of the report isn't hard to compute. Samsung has broken free from the malaise that seemed to affect the company's entire mobile division in 2014, and seems ready to take on all challengers including HTC, LG, and even Apple. Like Samsung, Apple has also been re-energized thanks to the larger sized screens available with the Apple iPhone 6 and Apple iPhone 6 Plus. 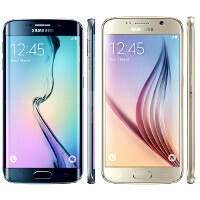 T-Mobile, AT&T, Verizon, Sprint and U.S. Cellular started accepting pre-orders for both the Galaxy S6 and Galaxy S6 edge last Friday along with the Samsung Collection at Best Buy. The phones should be available to be picked up on April 10th. We should point out that the report isn't clear whether the first four days of pre-orders for the Galaxy S6 and Galaxy S6 edge doubled the total amount of U.S. pre-orders for the Samsung Galaxy S5, or whether this year's pre-orders to date were compared with the first four days' total from last year. Either way, the results so far have been extremely impressive. still no official numbers !!! too bad. ya but samsung always like to hide the numbers of their flagships , even in official quarterly reports it's hidden, wonder why ? will they give us official sales info this year ? I don't think so. it's almost like they are ashamed or something , they are obviously selling a lot of them but they never give out info ever. No phone maker does this in their annual report. Did Apple specify how many 5C's they sold? Only a few hints for shorter periods (we sold X during the first few X). The fact that Apple has few models, is the only help to get some info there. HTC doesn't say how many M8's, Sony never said how many Z3's, etc. Apple usually gives info about the 1st week pre-orders , every year and they usually sell more new models than old ones like the 5c , so it's kinda easy to understand their numbers. plus Apple usually tells us how many iPhones it sold every quarter , not shipped to warehouses. Samsung OTOH sells so many models , even low end cheap phones like the galaxy j1 ,galaxy ace etc... who knows how many flagships they actually ship ? and how many are actually sold to customers vs shipped. they should man up and talk about how many they sold in the first month at the very least. it feels like they are scared to tell the truth !!! "Apple usually gives info about the 1st week pre-orders , every year and they usually sell more new models than old ones like the 5c , so it's kinda easy to understand their numbers." You just repeated what he said, but tried to spin it in Apple's favor. They do not announce individual model sales. And, no, Apple does not report sold numbers, they report sold and shipped. The phones shipped to retailers and carriers are reported in these numbers, but Apple can't know the actual sold numbers until those stores report them. Samsung doesn't generally sell directly to the public, so they can't report sold numbers. Stop letting your Samsung hatred color your perspective so much. False. When Apple released the iPhone 5, they actually continued to sell more 4S models for nearly 2 full quarters before the iPhone 5 started selling more. Apple numbers include ALL selling iPhone models. When Apple claimed they sold 75M iPhones for the last quarter of 2014,I have no doubt with what they had the carriers do like give away the phone free if you brought in a 5S, or give you $200 for a 4S and the iPhone 4 and 5C were both FREE if you signed a deal. Even Verizon reported they had lots of people switch to Edge to get the iPhone even after they had just bought a new phone only week prior. So yes, Apple could have sold more 6's vs the other models. However question is, in just 6 month, how many phones can actually be made. If Apple sold 75M in a single quarter, it is hard to believe that 50% of them were the most recent models hen per average Apple sells 35M phones per quarter. You really think they had 40M iPhone 6 models available to sell in just 3 months? If they did, then how come you still couldn't walk right into a store and buy one? Thank about it. I feel bad for everyone who bought a phone in the fall now. The buyers remorse will probably be significant. Can't wait for the S6 edge, everything about the device seems to be on point for me and probably a significant portion of the smartphone enthusiast population. Only problem is deciding which version to get (US, Canadian, UK/international) since I am fairly mobile between these countries. Hopefully they're all the same though this time. Well no, those are different product categories, at least for me. I wouldn't ever consider a Note phone/phablet because they're out of my comfort range. Still, you're right, other phone manufacturers will probably push the boundaries some how. Yet this phone is a fairly complete package in my opinion. There isn't one thing that I can say is a deal breaker for me in this thing or even a small consideration against it. The battery is just fine, lasts long enough with quick charging available. USB Type C is fine but I don't mind micro usb for now. That is pretty much the only downside of this thing. I got a Note 4 a few days ago. The features of the S6 just don't compensate for the absence of a removable battery and microSD slot, in my opinion. Funny, I've had mine for 6 months now, and none of those problems exist. But keep selling it, brother! BTW, I was looking up some benchmarks the other day, and it seems the Galaxy S4 had as good and faster storage speed benchmarks as the HTC M7, though the S4 had an SD card reader, and the M7 didn't. How can that be? A few milliseconds of lag here and there really doesn't bother me. I'm the type of person who has hundreds of tabs open at the same time, so I expect lag from all my electronics at some point. I push things to their limits. Initial hype. It would be impressive if if was double the number of the S4. The S5 was a flop! It's not that surprising it doubled those numbers. FYI, the Samsung sold more S5 units than the S4, it was considered a "flop" because it didn't reach the expectations of Samsung and fell short to the numbers of units sold initially projected. And why i am not surprised seeing you hating yet again on another S6 article? iBaby. The S5 was a flop? Here let me give you the facts. It took the Galax S4 exactly 6 months to sell 40M, the S5 reach this number in only 5 months. I hardly see that as a flop. Now, Samsung did state the sales after this did drop, but nto by as much as you think. I think Samsung expected to sell at least 80M of the S5, but ended up selling 60M - 70M instead. I hardly see selling even 50M of anything is considered a flop. If it is then every iPhoen model is a flop because Apple never sold 50M of a single iPhone model in a single quarter to date. Apple sells on average 35M phones per quarter. That includes all selling models, not just one. The reason Appel doesn't show their numbers based on model is because, new model sales don't start until the last quarter of the year and they are less than the previous 3 quarters. It takes 2 more quarters for the new models to catch up and by then the latest model is yet again being rumored and sales start to drop off. I know this as fact based on ATT's own sales numbers. ATT usually sales about 15M iPhones it the very first quarter of sales availability. BUt the 2 quarter of sales this number drops slightly to nearly 10M. After that in Quarter 3 they fall sharply to less than 7M. Those are rough numbers. Also just remember, Apple first quarter starts in October, while every other companies fiscal year starts Jan 1 and ends Dec 31st, while Apple's fiscal year ends Sept 30. And it all begins. The rise and come back of the true king of technology. Say all you want about software but sammy is boss when it comes to hardware tech. No company comes even close. Samsung never failed. In the reports where it said Samsung was losing money and sales, it was shown this was on the low and mid-ranged phones. The Galaxy S and Note. The Galaxy S and Note did not have any drop in sales. The facts show that each S and Note model, outsold the previous one. The S5 simply didn't have a huge gap in sales over the S4. Let me show you. The Galaxy S3 sold over roughly 50M units, the S4 sold over 60M. The S5 still sold about 60M+, but the gap was not that wide as Samsung expected to sell more than 80M. The S6 IMO will sell likely 70M buy itself and will have a fairly large sales gap over the S5, just like the Notes have done. The first Note sold 10M units in one year. The Note 2 sold 20M, while the Note 3 sold over 40 and the Note 4 has also sold over 40M, and close to 50M and the Note 5 will likely sell over 50M. Even with a slack in sales and profits, Samsung only sold 20M less phones for 2014 vs 2013. That is a small fall when you sold over 300M phones 2 years in row. Yet Apple has been selling phones since 2007 and have yet to sell 300M in a single year. Samsung is still the king, its just the haters don't want them to be. bro, don't get me wrong.. i need your sources with samsung sales number especially G4 please refer the link. I would say the iPhone 6 and 6 Plus will take a huge sales hit after April 10th. In fact, I expect that Apple will fall below the 35M they usually sell per quarter for the Spring quarter. I expect Apple to sell only 25M phones this whole Spring. If this is true, it shows that lack of expandable storage, no IP67 certification and non-removable battery is really hurting sales. Read closely before making a fool out of yourself.